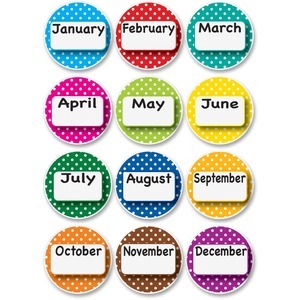 Die-cut magnets feature an easy-to-read format to let children see each month of the year. Write-on/wipe-off surface quickly wipes clean to make edits fast and simple. Built-in magnet sticks to magnetic surfaces for versatile display options. Dotted border in assorted colors helps you build a welcoming atmosphere.